What determines more than anything else whether a Web site will be found by those for whom it was intended, says Laporte, is the quality of the writing on a Web site – particularly the vocabulary used to describe it. Sporting a neatly trimmed beard and dressed in a slightly rumpled gray flannel suit, Laporte tilts back in his swivel wingback chair behind an antique tin-topped work table in the middle of a bedroom in an historic brick house at 123 Bay Road. A two-volume edition of the Oxford English Dictionary is perched on top of an old metal filing cabinet behind him. 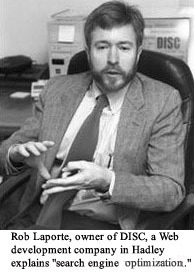 Laporte has a master’s degree and an ABD (all but dissertation) in English literature from the University of Massachusetts at Amherst where he also taught. He had put together a dissertation prospectus on the Elizabethan honor code as a major theme in Shakespeare’s plays and was headed for a career in academia when he discovered there was a dearth of professorships to be had, and he detoured into a career in marketing. He eventually went off on his own and started DISC (an acronym for Document Imaging and Scanning Company), now a full-service Internet design and search engine optimization company, 6 years ago. The company is doing about $300,000 in annual sales and employs eight, half of them full-time, half part-time, and several who work out of their homes, telecommuting. They include three programmers, a couple of Web analysts/copywriters and a graphic designer. There are many factors that determine the overall quality of a Web site, Laporte says, including overall appearance, ease of navigation, and how quickly the material downloads. But transcending these, especially for his business customers – many of whom are looking, he says, for return on investment (ROI) within a year or two – is the basic issue of getting people to arrive at the site to begin with. And not just any people, he adds, but the right ones – “good prospects,” potential buying customers. DISC’s clients in the area include, among others, Hannoush Jewelers, Fly by Night Futon furniture store in Northampton, R. Michelson Galleries, Kleen-Bore Inc. in Easthampton, GBI Marketing in Bernardston and Hardigg Industries in South Deerfield. Search engine optimization is a growing discipline within the Web marketing and development arena about which Laporte has made himself an expert, devoting scores of “unbillable hours” to doing research to keep himself up to date with fast-changing developments in the field. Some of his customers found him through free seminars he’s given in the area. Search engine optimization is the scientific-sounding term for a collection of linguistic and statistical tactics for getting any particular Web site placed high up on any list of sites that any of the major search engines – there are about 15 majors – will deliver to the screen in response to a particular query. Search engines are huge indexes of thousands of Web sites. Most are scanned by electronic “robots” or “spiders” that select out the addresses (called URLs) of individual Web sites in response to an individual’s query. The user initiates the query by typing in “keywords” or selecting a subject category from a given menu of options. The engines deliver their selections usually in a ranked order on the users’ screen, usually with remarkable speed. Search engines are not the only means by which people find Web sites. Word of mouth, traditional media advertising, banner ads on Web sites, e-mail “signatures,” and links from other Web sites are other ways. But Laporte cites various studies, including one done at the Georgia Institute of Technology, that show that search engines and links are the two most frequently used methods. 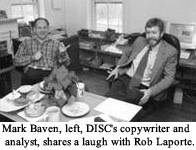 DISC strives to get its clients’ Web sites listed “in the top 10 positions for two or three terms on two thirds of the search engines,” says Laporte. After the 10th entry or the first page, there tends to be rapid drop off of users, who are notoriously short on patience, having come, rightly or wrongly, to expect instant results from their queries on the Internet. DISC does not guarantee these results, but the company does offer its customers tools by which to measure actual results. The firm sells “server statistics software” that produces charts and graphs detailing from which search engines visitors have come to their site, by what keywords, or from what links, affiliates or banner ads. He describes search engine optimization as a demanding discipline that requires equal parts linguistic and statistical savvy. The two perspectives are in fact inextricable in the actual work. “Good writing matters,” says Laporte, because it has everything to do with determining the position of a Web page in any list of entries delivered by a search engine. “To the extent that the writing contains a rich array of words that is relevant to the reader” – or the Web surfer in this case – “it’s good writing,” whether for the Web, or for any other medium, he says. The grid is derived from studies of search engine algorithms which provide a guide for how frequently keywords should be repeated and how they should be positioned and distributed over the entire page for optimum results. The process begins with “harvesting keywords” and key phrases from the client business or organization in order to come up with a select list of those terms that most precisely pertain to the particulars of the client’s mission, products and services. For example, in the case of Kleen-Bore, which develops gun care products, these words include, in order of prominence, gun, cleaning, bore, kleen, kits, accessories, care, rifle, hunting and supplies. Once the “universe of keywords” has been established, then copywriting, or what he referred to at one point as the “implementing of the words,” begins. The challenge in writing Web page copy that will attract good prospects – and keep them glued there – is to balance what DISC’s copywriter and analyst Mark Baven terms clear, terse, “no-nonsense” prose with the requirement to place and repeat the keywords in accordance with the pre-determined formula. Too much repetition of keywords not only will drive away information-hungry readers who generally have little patience with unproductive verbiage, but it also can get the Web site kicked out of most search engines who do not tolerate manipulative techniques to attract visitors to a site, according to Baven and Laporte. Interviews with several of DISC’s customers seem to suggest they are happy with the results they have gotten from Laporte’s application of his search engine tactics to their sites. The owner and founder of Kleen-Bore, Paul Judd, said having DISC upgrade his Web site has resulted in more hits and a growing number of retail sales, even though Web-generated sales still comprise only about one percent of total sales for the company which is primarily a wholesaler working through a network of distributors. His Web position report indicates the Kleen-Bore site is grabbing top ten positions for quite a few key words in quite a few search engines, Judd said, and this means he’s getting a lot of good “exposure” through the Web site, which is a major goal at present. “Being on that first page is key,” he says. The upgrade has been expensive – “in the five figures” so far – he said, and he anticipates he will be spending quite a bit more as he contemplates improving the shopping function, adding an on-line catalogue, making the site more “interactive,” and eventually transacting more of his business with his dealers on-line. At GBI Marketing in Bernardston, executive vice president Shane Hammond said the company’s “Internet traffic” has nearly tripled as a result of the application of search engine tactics by DISC staff, and the investment already has paid for itself. 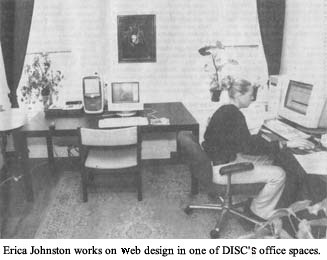 “They learned our business quickly,” she says of DISC, and that seemed to have paid off.